Magnets inspired by the work of Gaudí. Candelholders decorated with gaudinist style. Our craftsmen have created a few precious bottle-openers to use in your table or to adorn your showcase or both things simultaneously. Rectangular shaped metal mirror. Can be opened in two. On top of the mirror there is the famous mosaic of Gaudi. Dedals for the collector, or for anyone who likes a nice detail. Dedal for the collector, or for anyone who likes a nice detail. Set of saltcellar and pepper that will give a modernist touch to your meals. Inspired in the chimneys of La Pedrera. 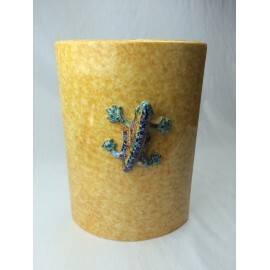 Candle holder cylinder decorated by the Trencadis of Gaudi and handmade by our craftsmen. Turnkey made with a sheet of wine-cellar of the Collection Gaudí. A detail of good taste that will accompany you at all hours. Collection of animals inspired by the trencadís of the famous architect Antoni Gaudí that will be used to decorate any shelf in your home or also to give to the collectors of these nice little animals that they appreciate so much. Horses Stock trencadís inspired by the famous architect Antoni Gaudí used to adornany shelf in your house or even to give to the collectors of these cute little animals so appreciated. The bull, brave, fierce and noble made with the trencadís that did the architect Antoni Gaudí so famous. Now you can get it to decorate every corner of your home. The brave, fierce and noble bull made with the trencadís that did the architect Antonio Gaudi so famous. Now you can get it to decorate every corner of your home. Original glass ball of snow with the Chimney Lodge.A memory inborrable Barcelona. Set of saltcellar and pepper that will give a modernist touch to your meals. Made on glass. Painted and decorated by hand. Collection of elephants inspired by the trencadís of the famous architect Antoni Gaudí that will serve to adorn any rack in your house or also to give the collectors of these nice little animals that so much they estimate. 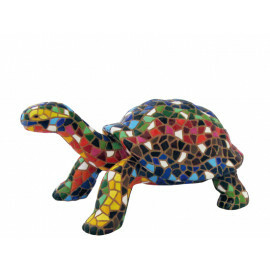 Turtle inspired by the trencadís of the famous architect Antoni Gaudí that will serve to adorn any rack in your house or also to give the collectors of these nice little animals that so much they estimate. Collection of tortoises nspired by the trencadís of the famous architect Antoni Gaudí that will serve to adorn any rack in your house or also to give the collectors of these nice little animals that so much they estimate. 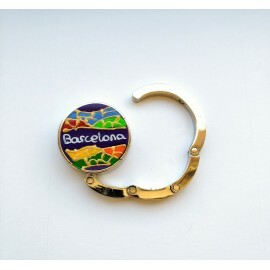 Key ring made of a cava metal top from the Gaudí Collection. A good taste detail that will accompany you everywhere you go. 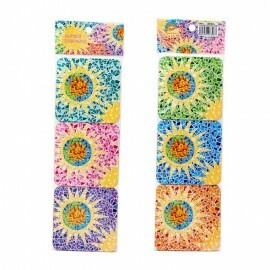 A keyring that you were taking always above, adorning your keys. Turnkey with fragments of the Trencadís of the famous artist Antoni Gaudí. The cat made with the famous trencadís (mosaic patern) used in many Antoni Gaudí buildings. The cat made with the trencadís that so famous there did the architect Antoni Gaudí. 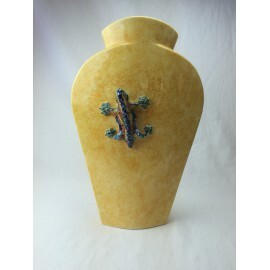 Now you can obtain it to decorate any corner of your home. 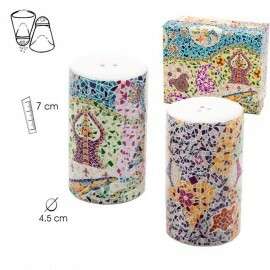 Original pepper shaker with the Amatller and Batlló Houses and so you can also dress the food and decorate your table. 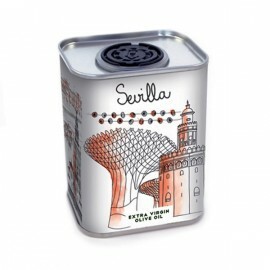 Original pepper shaker with the reproduction of the Pedrera so you can also dress the food and decorate your table. 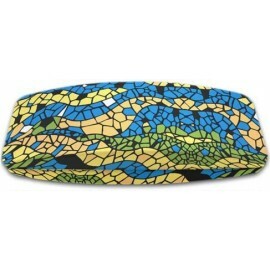 Glasses case decorated with Gaudi's motifs. A nice Santa Claus figurine, decorated with Gaudí famous trencadís. Resin candle holder inspired in trencadis of Antonio Gaudí. 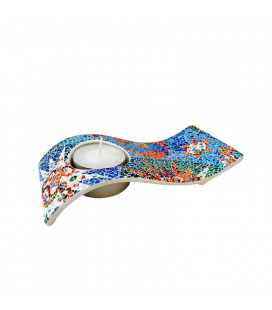 Resin candle holder inspired by the Trencadis of Antonio Gaudí. 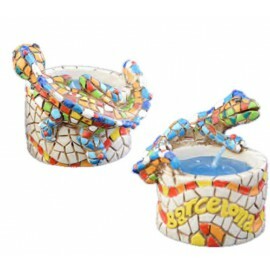 Candle holder decorated by the Trencadis of Gaudi and handmade by our artisans. 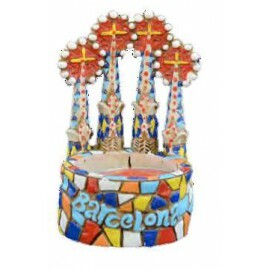 Candle holder decorated by the Trencadis of Gaudi and handmade by our craftsmen. 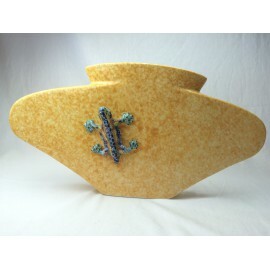 Salt and pepper with tray decorated with the famous Trencadis of Gaudi and handmade by our craftsmen. Salt and pepper + plate decorated with the famous Trencadis of Gaudi and handmade by our craftsmen. 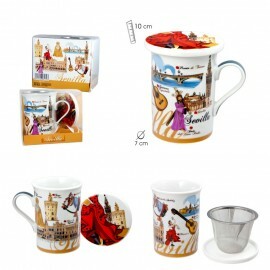 Salt and pepper with a tray decorated with the famous Trencadis of Gaudi and handmade by our craftsmen. 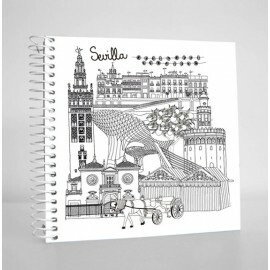 Cover glasses reminiscent trencadís covering the curved bank of Park Güell or drac located at the entrance of the park. 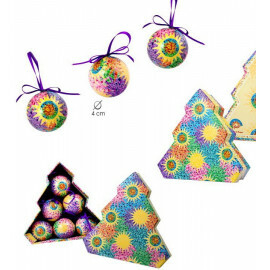 6 cardboard coasters collection anti-moisture decorated full color Gaudí motifs to use in your appetizer or your favourites drinks or to decorate the display cases where you have placed glassware. 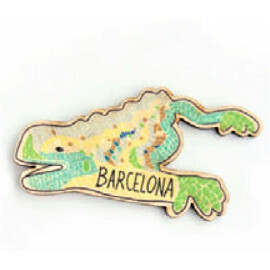 This tile magnet is a reproduction in ceramics of the pavement that is on many Barcelona streets' floor. 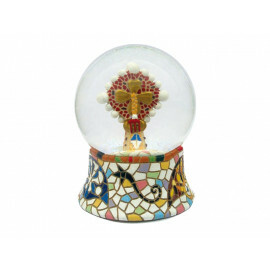 Christmas ball decorated with Gaudinian elements, such as trencadís, inspired by the architect Antoni Gaudí. Perfect to decorate the house or the Christmas tree. Cover of glasses with decorative elements inspired by the Batllo's House, located in the city of Barcelona, designed by the architect Antonio Gaudí. 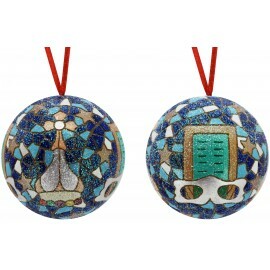 Christmas balls decorated with Gaudinian elements inspired by the architect Antoni Gaudí. 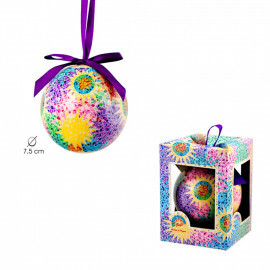 Perfect to decorate the house or the Christmas tree. 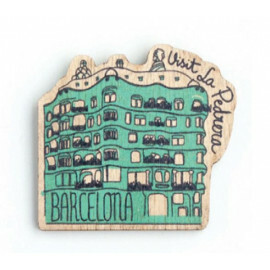 Collection of small magnets in wood about Barcelona and Gaudi. 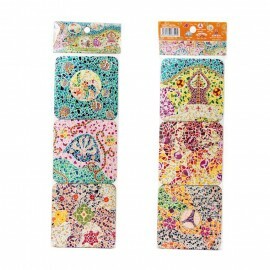 This magnet is a reproduction in ceramics of the mosaic found in Parc Güell's bench. Collection of animals inspired by the trencadís of the famous architect Antoni Gaudí that will adorn any shelves in your house or also to give to the collectors of these nice little animals that they appreciate. 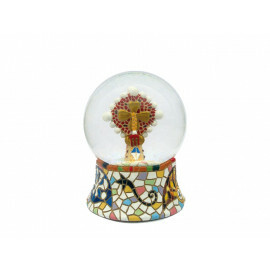 Original glass ball of snow with Sagrada Familia Pinacle. 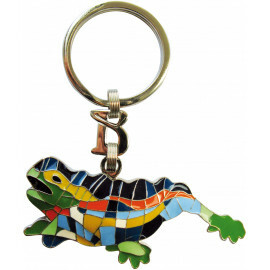 This key ring shows the dear lizard from Park Güell. The best way to keep your keys. Collection of animals inspired in the trencadis from the famous architect Anton Gaudí which will adorn any shelf in your home or for giving them to these cute little animals collectors that will appreciate these little gifts. 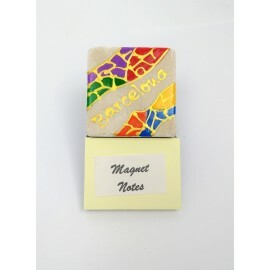 A magnet Gaudi-style decorating your fridge, shelf estimate or any metallic object, which can write your most important notes. A Gaudian style magnet that will decorate your fridge, shelf or any metallic object, in which you can write your most important notes. Incense perfumed our homes but also defiles our furniture with ash. 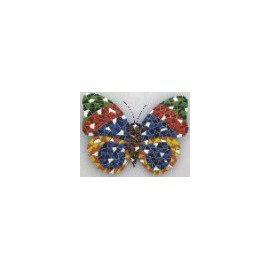 Butterfly inspired by the trencadís of the famous architect Antoni Gaudí that will serve to adorn any rack in your house or also to give the collectors of these nice little animals that so much they estimate. 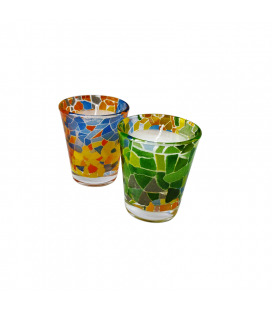 Salt and pepper set decorated with the famous Trencadis of Gaudi and handmade by our craftsmen. Reproduction of "La Giralda", the bell tower of the Cathedral of Santa María de la Sede of the city of Seville. Ceramic magnet inspired by the stairs of the Sagrada Familia Cathedral. MADE IN BARCELONA by our Artisans following a bas-relief process in ceramics with the application of enamels of color, the work is decorated by hand. 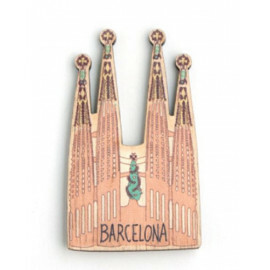 Ceramic magnet inspired by La Sagrada Familia Cathedral. 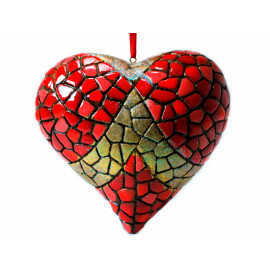 MADE IN BARCELONA by our Artisans following a bas-relief process in ceramics with the application of enamels of color, the work is decorated by hand. 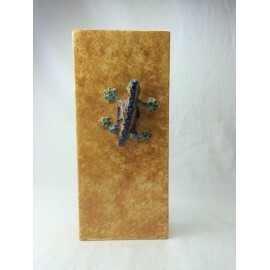 Ceramic magnet inspired by the lizard in the Park Güell. 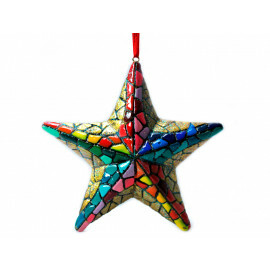 MADE IN BARCELONA by our Artisans following a bas-relief process in ceramics with the application of enamels of color, the work is decorated by hand. 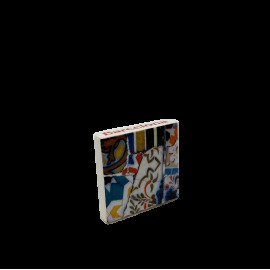 Ceramic magnet inspired by the ceiling of the Park Güell. 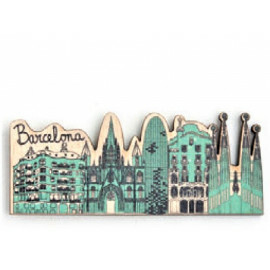 MADE IN BARCELONA by our Artisans following a bas-relief process in ceramics with the application of enamels of color, the work is decorated by hand. Ceramic magnet inspired by La Pedrera-Casa Mila. 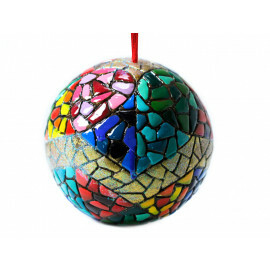 MADE IN BARCELONA by our Artisans following a bas-relief process in ceramics with the application of enamels of color, the work is decorated by hand. Ceramic magnet inspired by Casa Batlló. 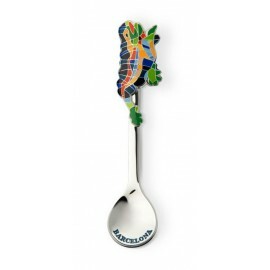 MADE IN BARCELONA by our Artisans following a bas-relief process in ceramics with the application of enamels of color, the work is decorated by hand. 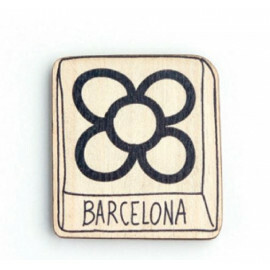 Ceramic magnet inspired by the Barcelona Flower tiles. 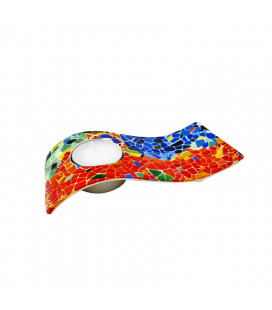 MADE IN BARCELONA by our Artisans following a bas-relief process in ceramics with the application of enamels of color, the work is decorated by hand. 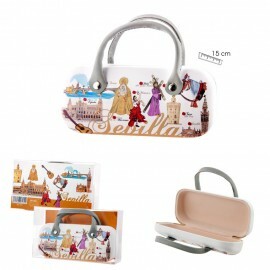 Colorful luggage tag with a Gaudi design. 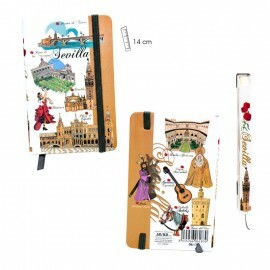 Magnet cardboard 5 cm / 1.97 inch.